While staying in Tokyo for several days, learn about Japan’s capital city on walking tours, browse unique shops, sample traditional Japanese food, and see fish markets and night markets. On a jaunt to the town of Hakone, bathe in the famous hot springs (onsen), see Mt. Hakone and Mt. Fuji; also take a scenic boat ride on Lake Ashi. During a few days in Kyoto, hike in a dense bamboo grove, see one of Japan’s best-known temples—the Golden Pavilion, and take a cooking class and eat what you create. 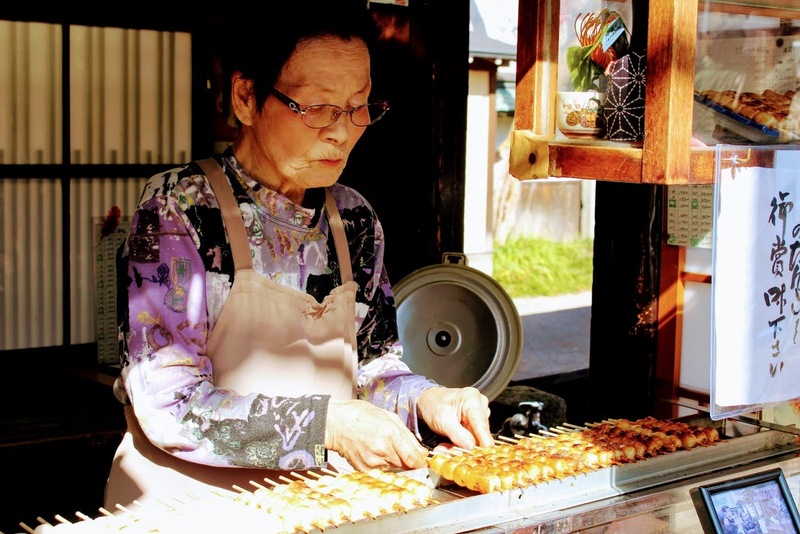 Ride a speedy bullet train to enjoy the foodie scene in Osaka—nicknamed Japan’s kitchen. Try singing karaoke in the land where it was invented. Spend a final day in Tokyo. This tour includes plenty of time to explore on your own or with tour leader Laura Heller. Laura is an experienced tour organizer and writer who loves to travel. She curated this Japan tour based on past trips to this intriguing country. All photos on this page are by Laura. Arrive in Tokyo, Japan’s capital, a city with an amazing blend of modern and traditional elements. Have a classic ramen noodle dinner for your first meal in Japan, then take an evening walk together to explore the neighbourhood. On a walking tour this morning, Laura will introduce you to the variety Tokyo has to offer. Browse stores on the shopping streets of Nakamise and Kappabashi. Visit the Asakusa Culture tourist information centre, a distinctive building with an observation deck on the top floor. Stop for fun snacks along the way, as you learn about cultural differences. In the afternoon, discover more of the city with Laura, or explore on your own. Recommended options include: a “crawl” of the many great cafes in Asakusa, people-watching to get to know the culture, a vending machine treasure hunt, going up the Tokyo Sky Tree—the tallest tower in the world, learning about Tokyo’s history at the Edo-Tokyo Museum, browsing the Kappabashi shopping street, or visiting Shibuya Crossing, the busiest intersection in the world, as well as the Shibuya neighbourhood. After dinner with the group, meet a Japanese expert for a language lesson and cultural lesson. Traverse the city by subway! Visit the old and new fish markets, then have a sushi lunch near the old Tsukiji fish market. See the charming, traditionally-styled Hamarikyu Gardens. Then take a water bus back to Asakusa for some free time to investigate on your own or rest at the hotel. Meet up with the rest of the group at dinner time for a street food walk at the Ameya Yokocho night market, where you might try delicious options such as chicken on a stick, takoyaki, mochi, conveyor belt sushi, green tea ice cream, and more. After eating your fill, scout out Tokyo’s night life—see Shinjuku ward, Akihabara electric city, impressive department stores, and the beautiful Tokyo railway station. Transfer to Hakone, a mountainous town known for its hot spring resorts (called onsen) and views of the iconic Mount Fuji. Check in at a ryokan, a traditional style of Japanese inn which originated in the 8th century. Learn about the ryokan and wash away your troubles as you bathe at the onsen. Optional morning bathing at the onsen. Then explore Hakone as a group. See Mt. Hakone and Mt. Fuji, and enjoy a boat ride on the scenic Lake Ashi. Experience different forms of transportation, including boat, train, tram, and more. After lunch, board a bullet train to Kyoto, and be astonished at the speed with which you cover the ground. This morning, get acquainted with the city of Kyoto and some of its most significant sights. See Arashiyama, an incredibly dense bamboo grove with tightly-packed, towering stalks that surround you as you navigate the trails. Discover a tasty lunch at Nishiki Market, renowned for its delicious street food. This afternoon, explore with Laura or on your own. Options could include: Gion neighbourhood and Pont-Cho Alley, best known for being home to geiko houses and traditional tea houses; Nijo Castle, a 17th century fortified structure designated a UNESCO World Heritage Site; or the Kyoto Samurai and Ninja Museum. Have dinner in the Gion neighbourhood and enjoy a traditional cultural entertainment in Pont-Cho Alley. Start the day with a visit to one of Japan’s most famous temples—the Golden Pavilion, Kinkaku-ji. Originally dating to the 14th century but reconstructed after a fire, the Golden Pavilion is an impressive structure set amid a magnificent classical landscape garden. Then divide into two groups for a special opportunity—a cooking class in the home of a local! The first group will have the cooking class at lunch, and the second group will have the class at dinner. During the time you’re not in the cooking class, you’ll have free time in the city. This evening, sing your heart out (or just watch) during karaoke in the country which invented it! Today’s special experience is a foodie trip to Osaka. Take the bullet train to Osaka, a port city famous for okonomiyaki, a special type of savoury pancake. Take a walking tour to find foodie places and enjoy lunch together. In the afternoon, discover more of the city on an optional bicycle tour, or wander on your own. After savoring one more incredible Osaka meal, head back to Kyoto. Take the morning train back to Tokyo. After lunch, enjoy exploring one of Tokyo’s top shopping districts, the Ginza, as well as the Golden Gai known for its nightlife. Or make your way to the Meiji Jingu shrine, Tokyo’s most famous Shinto shrine, appreciating its tranquil air. During free time this afternoon, pack up and prepare for your departure tomorrow, go shopping for last-minute souvenirs, or take advantage of your last opportunity for sightseeing in Japan. Over a final meal together, reminisce on the tour and ask a Japanese expert any remaining questions you may have about this fascinating country. Depart for home, full of memories of everything you’ve experienced.